In the past, we have discussed several Samsung devices in comparison to other Android phones, but let’s see how both of these Samsung phones compare with each other. We have the Samsung Galaxy Grand 2 and Samsung Galaxy A3 with us to compare today. Well, both are what you call the secondary phones to the Galaxy series and both have their plus points and negative points. Just after a blink you’ll see the comparison charts for both devices. 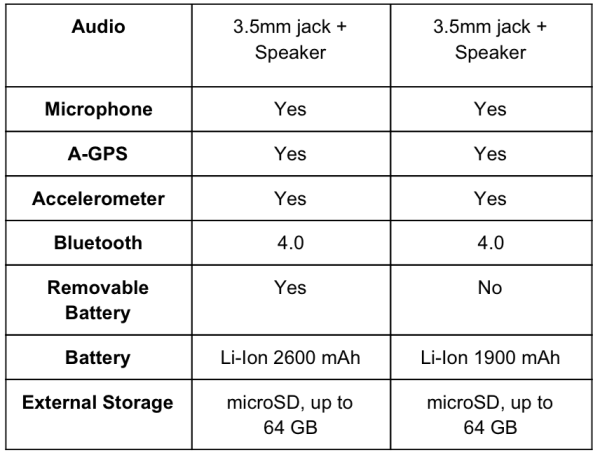 Other than a quick detailed comparison of the specifications below, we have put together a small chart as well where you can compare both of these Android phones side-by-side. Find it after the jump! As for this generation, the new hit trend is the “screens larger in size”. If you too follow this trend but don’t have the budget for a high-end device, Galaxy Grand is just the right choice to make. As the name indicates, it gives you 5.25-inches of screen with 720 x 1280 pixels. As you would already found out that it has screen size in the ratio of 16:9 which is just perfect for watching your favorite movies or playing your favorite game. This assisted with Snapdragon 400 (which is just an average chipset) and Quad-core 1.2 GHz Cortex-A7 which makes it a little more better phone. The Quad-core processor is assisted by 1.5 GB of RAM allows you to seamlessly do your work without any lag. Other than that, camera is pretty much average at 8 megapixels, but what makes it interesting is the Samsung’s favor functions. For example the sound & shot functions which only comes with few Samsung devices. Samsung also provides it with the Group Play feature so that you really feel being a member of the Galaxy family. Some other features include, dual SIM compatibility 1.9 megapixels front camera and Bluetooth integration. Samsung Galaxy A3 looks like to be manufactured by keeping in mind the day to day primary activities of a user. If we look at its hardware, it come’s with a Quad-core 1.2 GHz Cortex-A53 which is fairly good for average use and a slightly better CPU which is Snapdragon 410. It comes with exactly the same amounts of Gigabytes when it comes to RAM. Samsung Galaxy A3 also comes with 1.5 GB of RAM. 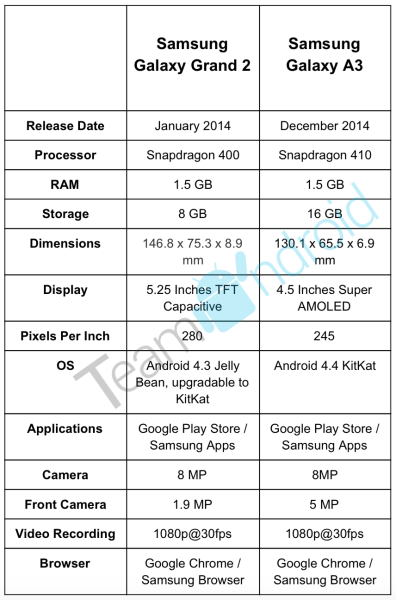 Screen size is a lot smaller than the Galaxy Grand 2, Galaxy A3 has a 4.5-inch screen with a lot lesser pixel density. But yeah a very good plus point of it is that it comes with a Super AMOLED screen, which leaves an amazing impression to the user. Other than that, Galaxy A3 also enjoys most of Samsung Galaxy features, and the additional camera features too. It also has 4G compatibility where it pretty much steals the lime light. Makes it just the right phone for you to buy in a low budget. Well, both of the phones are very good in their own way. What we think is if you are into larger screen sizes, than the Samsung Galaxy Grand 2 should be your choice from the above. But if that is not the case, you can grab the elegant Galaxy A3 which we think is a perfect phone in the same price category. Plus we think, if we compare both of the devices, Galaxy A3 takes the lead any way, because of a better but smaller screen, better camera, well back camera is same, but front camera of Galaxy A3 is 5 megapixels which is a lot better than Galaxy Grand 2. It has 4G compatibility which is a plus point. So this is what we think. Leave us with what you think in the comment section below. Interested in all kinds of android products and love to write about them.